Your guest will almost feel the warm ocean breezes, hear the waves breaking on the beech and feel the heat of the tiki torches - transform your entire room into a tropical luau paradise with the Luau Insta-Theme. Check out all of our luau scene setters and luau decorations to transform your entire room. This Insta-theme can be easily placed on any wall or fence to bring the Beach Background to any party. Bring the beach indoors and host a luau party any time of year no matter what the weather is like outside. The Insta-Theme backdrops are 30 feet wide and can be cut to fit your space. Start with the Blue Sky & Ocean Backdrop and the Beach Background, then customize however you wish. Add Tiki Torch props and Tiki Bar props to make if look like you are at a beachfront bar. Add some palm tree props and surfboard peel 'n place stickers to accent certain areas. 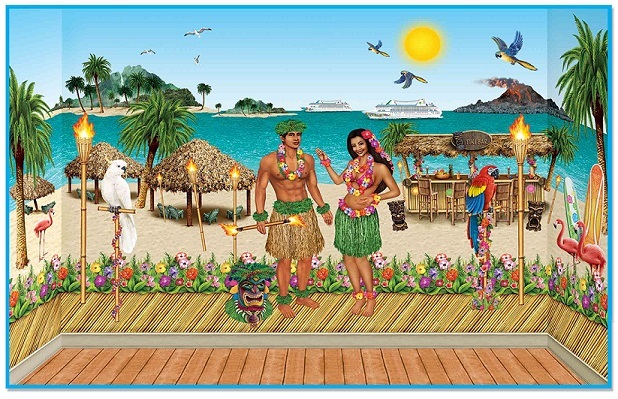 Finally, add the Hula Girl & Polynesian Guy to make it an official Luau party. All of these props and luau scene setters can be reused and combined with other Insta-Theme decorations like the Pirate Insta-Theme. Don't forget to check out all of our Luau Party Supplies to make your luau party complete.